Which Ingredients Make the Perfect Hunting Land for Sale? If you are one of over 15 million avid hunters in the United States, then you know the importance of pristine hunting land for sale. Whether you are in search of the perfect place to visit with your buddies or a property where you can truly “live off the land,” there is a checklist that you must follow. So, what should you be looking for? What are the perfect ingredients that create ideal hunting land conditions? Before you write a sizable check to make that important purchase, be certain that you have the right components for hunting success. What Are Your Plans for Hunting Land for Sale? While the popularity of deer hunting is unparalleled, other popular game include turkeys, squirrels, rabbits, and quail. We’ll get into specifics later, but the best available land for sale in Ohio is an open space with plenty of wooded areas and a clear source of water. What size lot is good for hunting? For smaller or slower animals, such as turkeys and rabbits, it’s best to have at least five acres. For deer, ten acres or more is ideal. A good rule of thumb regarding land size and wildlife is: the bigger the animal, the more space you will need for hunting. Until this point, you may have hunted for pure personal enjoyment; however, owning hunting land that’s for sale in Ohio may offer new opportunities to generate revenue from the land. As such, the more you “upgrade” the land, the more income potential you will have. The most straightforward way to start earning income on your hunting land for sale is to rent your property to fellow sportsmen. If you don’t intend to live on the property or hunt all year long, why not temporarily rent to others? Who can ignore income without much inconvenience? Another potential avenue for income is investing in a farm for sale. A property with food plots will undoubtedly attract wildlife (and feed you and your family, too). Animals, such as deer, do not normally find it difficult to locate their own food; however, food plots give deer easier access to the nutrients they need to develop and mature more quickly. As a result, the deer on your land will produce high-quality meat. What do deer like to eat? Hay, beans, and corn all provide deer with much-needed calories. There should also be a distinction made with regard to your food plots. Feeding plots keep your deer healthy, whereas hunting plots draw deer (or any wildlife) onto the property. Hunting plots should include crops like winter peas, brassicas, and cereal grains. These crops specifically attract whitetail deer, for instance. The best location for hunting plots is between the feeding areas and the bedding areas. This way, at the beginning and end of the day, the deer will flock to this area; doing so will make it easier to hunt them on your Ohio real estate. The key to successfully attracting any animal is having exactly what they need, when they need it the most. Other improvements that you can make to increase income include cutting access roads through the property. This will allow for more hunting area and keep wildlife on the property. If you are so inclined, you can even have a cabin built. Later, when you choose to sell land, you’ll have everything you need to convince the land buyers that you have done your due diligence and this is the perfect land for hunting. Your first, and possibly the most important, ingredient for buying perfect hunting land for sale in Ohio is a sign of wildlife. You might be thinking, “No kidding.” Unfortunately, the seller might be under the impression that the land has deer, turkeys, and other animals, when it doesn’t. Or, you might be walking into a scam. It might be obvious, but make sure you scout the land yourself. What should you look for? Check for deer rubs and tracks, which indicate that the land has been used for hunting before. Also, assess the diversity of the hunting land for sale. The more diverse a piece of land, the better it is for a sportsman like you, and your family and friends. The best land will have just the right combination of briars, shrubs, weeds, grass, and hardwoods. Having these building blocks ensures that the available land has everything that wildlife, such as deer, need year-long. We alluded to acreage above, but want to reiterate that sportsmen and trappers alike need several acres available to hunt. As discussed, the wildlife you plan to hunt will dictate the acreage you need; but the method you use to hunt (e.g., rifle, bow and arrow) and the number of hunting partners is also important. There has been much debate as to how much land you need in order to hunt for certain game. For example, if you and a partner want to go deer hunting and you plan on using rifles, ideally you will want at least a 50-acre area. If you prefer to hunt for deer alone, you can get away with an area of 25 acres. When you use a bow to hunt deer, you can get away with a piece of Ohio real estate no bigger than 10 acres; even if you have hunting partners along with you. In the specific case of deer hunting, a piece of Ohio hunting land is a great choice where there is enough healthy oak. Oak is a source of food for the deer and will keep them on the land. If you want to ensure they stick around, the land needs to have other sources of food and bedding. The easier the deer can access these elements, the more likely you are to be able to catch them. As such, pine and hardwood trees are also very desirable for deer; they will actively seek them out when they are hungry. Hardwood trees attract deer because they contain the acorns deer like to eat. Water is also an important feature for a successful hunting property for sale. A deer needs approximately 1-½ quarts of water per day. As such, your land should have a few small sources of water for deer or other animals to wander about the property. 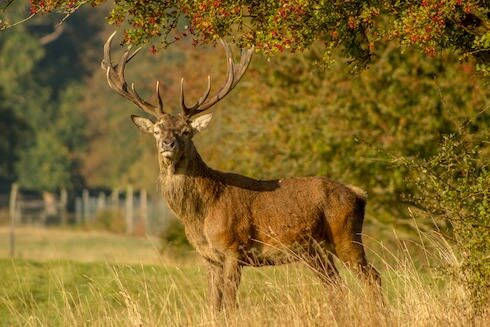 The ideal hunting property will be located near other hunting properties, or farm land for sale, for that matter. Consider this rule of thumb on deer: If you are looking to buy Ohio land, specifically to hunt deer, ask your future neighbors if they have deer on their property. Also, research the area to find out if the wildlife you seek is known to frequent that area. And, while you’re at it, you may want to look at how large the wildlife tends to be. That is a good indicator of the size of the wildlife you might expect to see on your land. It is important to purchase land where you’ll have places you can conveniently hide from deer. Being able to remain unseen will make it easier to catch as many deer as you’re seeking. One of the best ways to do this is to buy land that has hills. The element of surprise is your biggest asset when hunting; so the more hills a property has, the easier hunting deer on it will be. Being able to see deer without them seeing you is important; however, it is also important that you purchase land that has enough access points. Deer, for instance, are smart enough to know where the danger lies; if you continually hunt them from the same exact direction, other deer will learn to avoid the danger. As such, try avoiding a pattern for an attack. Develop two or three access points, which will increase the likelihood for a successful pursuit of your game. Finding the perfect land for hunting is not an easy task. With so many factors to consider, the process when you purchase land can be extremely lengthy. That’s why you need expert advice from a real estate firm that knows the landscape. Ready to claim space and pursue your favorite game? The Robert Weiler Company has helped many sportsmen find hunting land for sale in Ohio. Contact one of our land broker specialists today at 614-221-4286.